Need to lock up the fridge, oven, cupboard, etc. to keep out the kids (or pets!)? Anywhere you can place this lock on a door and around a corner edge, it will work! Cut two pieces - 2" x 2" (5 cm x 5 cm) - of self-stick loop Velcro®. Cut one piece - 6" x 2" (5 cm x 15 cm) of hook Velcro®. Cut this piece longer if needed to wrap around corner of fridge or cabinet. 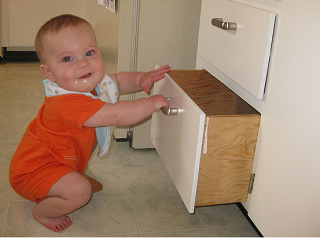 Place high, out of your child's reach, on the fridge, microwave, freezer, cabinet, etc. - wrapping it around the edge of the door and onto the body of the fridge, microwave, freezer, cabinet, etc. Clean the area with an alcohol wipe first, for a strong adhesive effect. Peel off protective papers, and stick loop Velcro® pieces into place - one on the door, one on the side - about 6" apart (or further if you cut a longer Velcro® strap). Let dry overnight for best results. To use: Just unfasten hook Velcro®, and open the door. Then refasten when the door is shut.